Moon moving away from conjunction with Jupiter, approaching trine with Venus. It’s not exactly a diagnosis you’d be thrilled to receive from your doctor, but this was the medical opinion Lucy Boswell received when she visited hers in 1602 to ask whether she might be pregnant. It was just one of the verdicts that astrologer-physicians Simon Forman and Richard Napier doled out to thousands of patients across decades of practice. 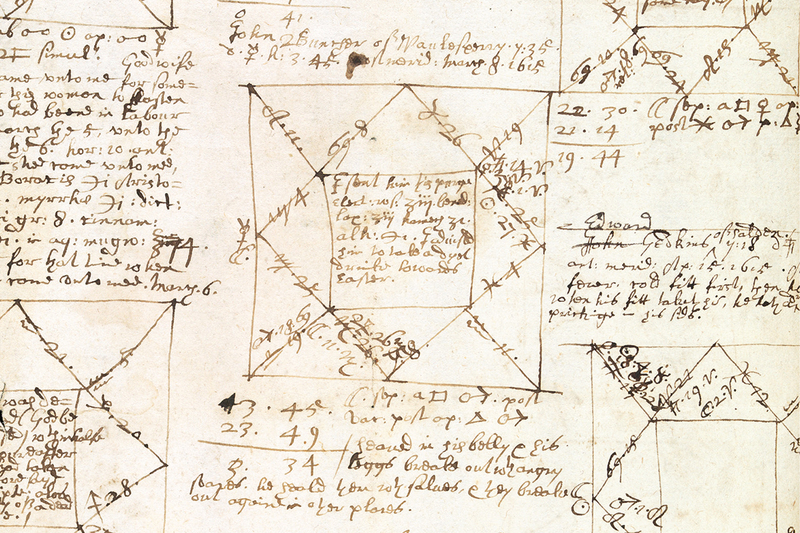 Their accumulated notes – some 30,000 pages of horoscopes, religious speculations and documented physical symptoms – form some of the most extensive private medical records in history, and are the springboard for Casebooks, a new exhibition in London. For the past 10 years, the University of Cambridge has been digitising Forman and Napier’s archive for public access. Available free of charge, it makes for fascinating, if baffling, reading. Lucy Boswell was told she had been cursed by a witch (sharing culpability with the moon); that this passed for medicine, even in the age of bloodletting and belief in the four humours, is mildly alarming. Casebooks serves to highlight the digital archive’s existence. The curators invited six artists to take inspiration from Forman and Napier’s curious practice. Lurking beneath a University of Westminster building just off Marylebone Road, and accessed via an underground car park that wouldn’t look out of place in a CSI cold open, the exhibition at the Ambika P3 gallery greets you with shouted slogans. Jasmina Cibic’s Unforseen Forseens (shown above) is a corridor, filled with painters who constantly redecorate it with stamps that show the iconography of progress through generic, propaganda-style images. And the painters punctuate their work with staccato, Soviet-era pronouncements about the glory, importance and predictability of the future. Their rhetoric is repetitive – all bombast, no substance – by chance echoing some recent pronouncements from the Trump administration. In the weeks leading up to the March for Science in Washington DC on 22 April, the topicality of Cibic’s piece can only grow. Some of Casebooks’ artistic interpretations are more literal than others, but no one felt it necessary to hide behind the time period of the source material. 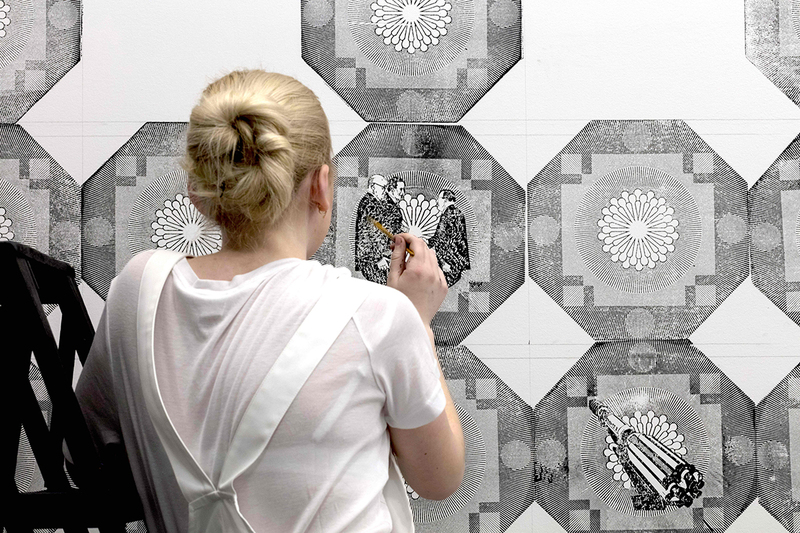 Here you’ll find artists ready to tease out our modern and oh-so-technologically advanced relationship with the alchemical, the astrological and the anatomical. 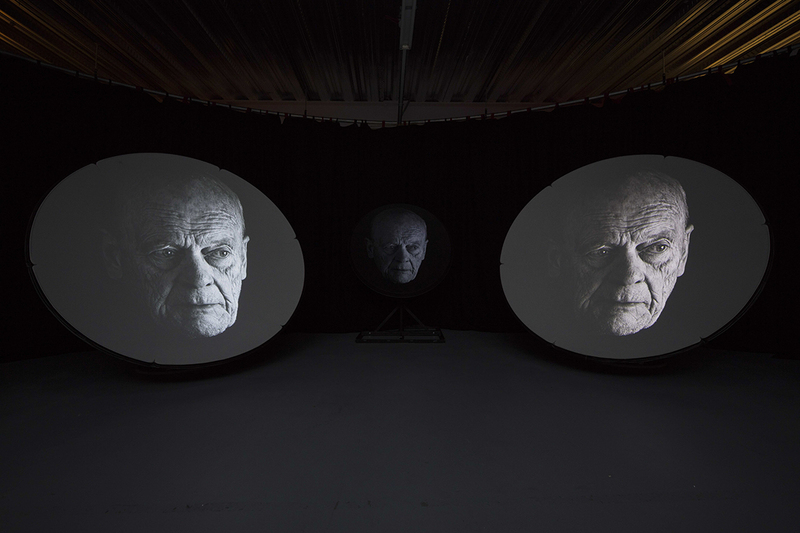 Mental Metal, a video installation projected onto three satellite dishes by Lindsay Seers, serves as a subtle reminder that, like Forman and Napier, we still appeal to the stars for answers, albeit in more cogent and quantifiable terms. Through the seamlessly alternating dialogue of an actor who plays both Forman and himself, artist Lindsay Seers blends medieval and modern concerns to highlight that they really aren’t all that different. Is she cheating on me? How do I move on from loss? Can we ever have children? If you loathe the idea of a person purporting to tell you your fortune, how do you feel about taking advice from an AI? Artist Lynn Hershman Leeson subtly undermines our ridicule of past practices with a real-time “consultation bot” that blurs the boundary between superstition and fact, nudging uncomfortably close to the role that Google and WebMD play in modern life. Her 3D holographic Real-Fiction Botnik offers 17th-century-style personal predictions: it can “diagnose” you and deliver your horoscope. Leeson’s work reminds us that superstition and home remedies delivered by seemingly trustworthy digital emissaries are still nothing more than the sum of their parts. Before leaving, spare a final, contemplative moment for Federico Díaz’s BIG LIGHT, a deep pool in which a lone figure tends to a robotic arm draped in foliage. There’s more than an echo of Studio Ghibli anime in this portmanteau creature, and it does well in making sense of Casebooks’ unifying theme: why we fleeting inhabitants of the universe look to the eternal fixtures of the natural world for answers to our internal dilemmas.